Authors Jon C. Rogers and Jack Hagerty delve into the history of real and imagined flying saucers in their new book "The Saucer Fleet." Couldtoday?s widespread belief that flying saucers are extraterrestrial spaceshipsbe the result of an unintentional, civilian conspiracy? One that createdreal flying saucers in order to achieve its end? 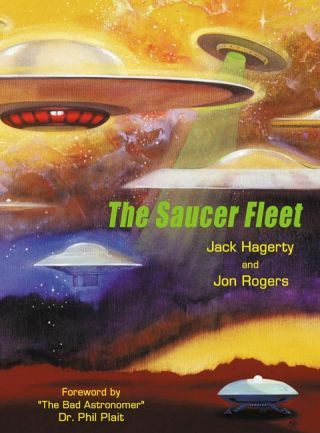 Now,historian Jack Hagerty and I may have uncovered just that in our latest book, ?TheSaucer Fleet? (Apogee Books, 2008). What we discovered was that the desire tomake money from a current news event led several major entertainmentcorporations, perhaps the entire industry, into individually promoting the samesensational, but unproven theory with all their persuasive power. Thus theyeffectively became co-conspirators in the greatestpublic deception of the 20th century! It is a phenomenon that today, havingexisted for so long, is taken as indisputable fact. How did ithappen? To begin with, we analyze the social environment that created theoriginal "flying saucer scare" that occurred just after World War 2.Then we show how people in the entertainment industry grabbed at that event,quickly producing books, articles, art, movies and TV shows all promotingthe same idea, the idea that the lights people had seen in the sky were spaceshipsfrom another planet. We pointout that ?Thus, becauseof a politically charged environment, the Saucer Fleet had changed the world.And the major movie [studios] had finally stepped in to carry their image - andtheir message - to people everywhere.? Central tothe book, we thoroughly examine the resultant popular films, like ?The THING,? ?TheDay the Earth Stood Still,? ?War of the Worlds?, ?This IslandEarth,? ?Forbidden Planet,? ?Earth vs. the Flying Saucers,?TV shows like ?Lost in Space,? ?The INVADERS,? advertisingcampaigns and Newspaper Adventure strips - all containing real flying saucersthat were created to convince people of a controversial idea. In the book, weexplain, ?Our main mission here is to [uncover] some new facts about realflying saucers....?? Originally ?flying saucers were invented, developed, andflown by humans. Ironically, they had their name stolen by the very thing theywould have become?in time. Hagertyreveals the hidden story of Christ being crucified in ?The Day the EarthStood Still,? and observes that ?War of the Worlds? is ?so deeplyentrenched in our culture that there will probably be versionsof it being made for the next 100 years.? These discoveries reveal messagesthat are hidden in our culture today. In thisway, ?The Saucer Fleet? contains many fascinating facts that reveal adifferent explanation of where flying saucers came from and why they are here.As we state early in the book, ?We want to give you a new appreciation for thetremendous human effort that went into creating these popular mediaevents [real flying saucers]." JonRogers is an author/illustrator living in Bow, Wa., andco-writer of ?The Saucer Fleet? and ?The Spaceship Handbook? with Jack Haggerty. This account of ?The Saucer Fleet,? available here,was written for SPACE.com.